The war against ISIS has forced 3.1 million Iraqis to flee their homes. An additional 251,000 Syrians are registered as refugees in Iraq. After facing floods, snow and ice this past winter, the summer has brought sandstorms and highs of 50 degrees Celsius. Some 250,000 displaced Iraqis and 100,000 Syrian refugees are living outside in camps under canvases and patchworks of tarpaulins and blankets which barely shield them from the blistering summer heat. The impact of the heat is severe. “During the summer, we usually see an increase in [deaths] as a result of gastroenteritis,” says Mostafa Munjid, a doctor with the International Medical Corps who oversees medical care in four displacement and refugee sites. “Sometimes because of the camp situation and storage of food; sometimes because of contamination of water,” Munjid explains. In Baharka, the camp in northern Iraq, the tactics are similar to Baghdad. “We distributed air coolers,” says camp manager Ahmed Ramadan Abdul of local NGO the Barzani Charity Foundation. “They can use them if there is electricity.” Ahmed hopes a donor will provide a second generator for the camp to allow more people to benefit. But the use of the air coolers is problematic even if there is electricity. They use between 100 and 160 litres of water per day. International organisations are advised against providing them, to avoid burdening infrastructure. A scuffle broke out last week, for example, between two families in Erbil's Kawergosk refugee camp vying for a share of the sporadic water supply. Originally constructed in August 2013 as a transit camp for 6,000 people, Kawergosk is now home to more than 10,000 Syrian refugees. Built by the UN’s refugee agency, UNHCR, and managed by the Danish Refugee Council, the infrastructure is under extra pressure during the summer months, raising tensions in the camp. Three boreholes work continuously to provide water; trucks deliver an additional 80,000 to 100,000 litres every day. Power is supplied for a predictable 19 hours per day, but water is available for only four hours, and at erratic times. “For two years, we have all been fighting over water,” says Siham Mohammad Yasin, head of the Kawergosk residents’ Water, Sanitation and Hygiene committee. Water pressure is patchy and the inequality causes divisions. Residents closer to the pump cultivate attractive beds of sunflowers, while those living at the end of the pipe sometimes have barely enough water for washing. 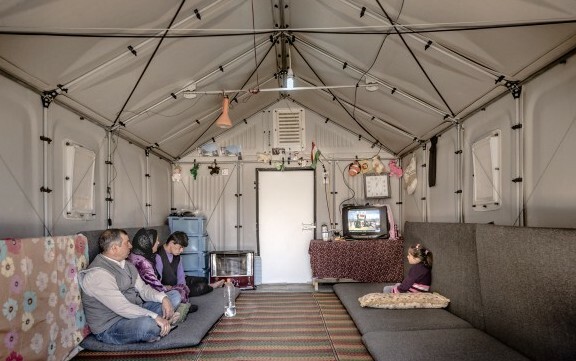 As the Syrian refugee crisis wears on, there has been more of an effort to come up with longer-term housing solutions that offer a greater emphasis on sustainability. Kawergosk now has three types of shelter, with different levels of heat protection and water provision. The camp's 12 most vulnerable families are in Refugee Housing Units, the result of collaboration between Swedish furniture manufacturer IKEA, UNHCR and Better Shelter. The innovative “flat-pack” structures offer some climactic control thanks to a specialised shading sheet on the roof and rigid, opaque walls as opposed to sun-absorbing canvas. Around 300 of these units are being tested across Iraq. On the other side of the camp, Wasila and Mahmoud live with their five children in a “permanent-phase” shelter, built, at least in part, with breeze block walls. They have their own toilet, washing facilities and a kitchen. There is a concrete foundation beneath their tent and extra land to put up shading. “We have more space for the children and more privacy,” says Wasila. Thanks to an air cooler, a fan, and winter blankets used to block out the sun, the temperature is bearable. But delays in completing these permanent plots mean that although the UNHCR tents are meant to last just nine months, more than half of Kawergosk's residents have lived in them for two years. They share communal latrines, cooking facilities, and four water taps between 25 families. Without walls and space for shading, it is much harder to keep these tents cool. They are the most visible populations that suffer from the extreme summer heat, but those in the camps only represent a small minority of the people in Iraq who need help with shelter. The International Organization for Migration reports that 67 percent of displaced people live in rented houses or with host families, another 10 percent in abandoned or partially constructed buildings, and a further 10 percent in informal settlements, schools or religious buildings. Azneef is an Armenian Christian from Hamdaniya in northern Iraq. After fleeing the ISIS advance last summer, she stayed in the skeleton of an incomplete shopping mall, but left after falling down some steps and smashing glass into her eyes and hands. After her daughter found work as a hotel receptionist, they managed to rent a house in Erbil, but Azneef says the cost of the air-conditioning in the summer may force them to leave. “I know we will not be able to pay the electricity bill,” she says. Azneef hopes friends in Erbil's Armenian Christian community might help her buy a pre-fabricated cabin to live in instead. As more and more displaced people run out of resources, there is concern that many will be forced to move into camps, where they do not have to pay rent and facilities are free. Such a shift has a recent precedent in Iraq. Since the contraction of the Kurdistan region's economy in 2014, many Syrian refugees who could no longer find work moved into camps. Even previously unpopular sites are now full. “If we don't have the resources to support people in rental accommodations, we will have to find space in the camps for millions of people,” says Tom Corsellis, Iraq Shelter Cluster co-chair. Accordingly, people living outside camps are prioritised for so-called “summerisation” assistance. NGOs and INGOs are encouraged to distribute unconditional cash assistance to help people living out of camps cope with the heat. “Sealing-off kits” provided during the winter block the windows of abandoned buildings, helping to even out daily temperature changes during summer. But due to lack of funding, only the most vulnerable have received summer shelter support. “It is much cheaper for people to stay in cities,” says Corsellis. “If we don't have money to help them do so, we'll have to invest in new camp infrastructure.” For an underfunded humanitarian response already cutting programmes for desperate refugees and displaced families, the knock-on effects could be disastrous.